OUR NEW WEBSITE WILL HAVE ALL CURRENT ANNOUNCEMENTS, SIGN-UP GENIUS, NEWSLETTERS, ETC. WE LOOK FORWARD TO SEEING YOU AT OUR NEXT GMC MEETING. who wish to participate in or contribute to the Mothers Club Activities. The Mothers Club sponsors many activities at Gonzaga - please click on the Events & Activities tab above to learn more. Stay up-to-date by clicking on News & Announcements on the left. The GMC meets on the second Wednesday of the month in the Lower Commons (cafeteria.) ALL ARE WELCOME! 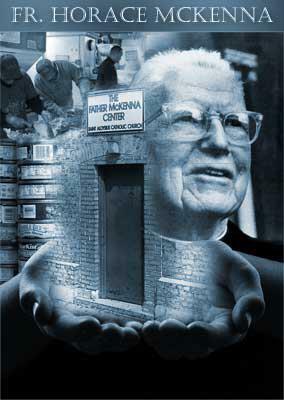 Please bring donations for the McKenna Center & WSG to any meeting. Please help on this fun project prior to heading to the Championship Football game! Join us from 9:00 am to noon to assemble and wrap baskets for the Gala. No experience needed! Just a few hours of your time. We'll provide the baskets, wrap, bows and fun! I can’t believe it is already November and Thanksgiving is right around the corner. We have so much to be thankful for on Eye Street, including our many dedicated moms contributing to the GMC. We are thankful for our Faculty Treat Chairs, Maria Cindea, Kristen Kilguss and their team of moms, that arrive before dawn to feed our faculty and staff. We are also thankful for our Father McKenna Center Chairs, Michelle Aldridge, Erin Donovan, Morgean Hirt and Valerie Jopeck, who have organized the collection of sheets and coats and purchased blankets and pillows for the Hypothermia Unit. They also have set up the meal signup for the months of November through March. Thanks to all who have signed up already -- spaces are still available (click McKenna Center Meal Signup). We are also very appreciative of all the families who supported the Bake Sale, whose profits support The Father McKenna Center! If you missed the Bake Sale, you can still support The Father McKenna Center at the Mass of Thanksgivingon Sunday, November 12. 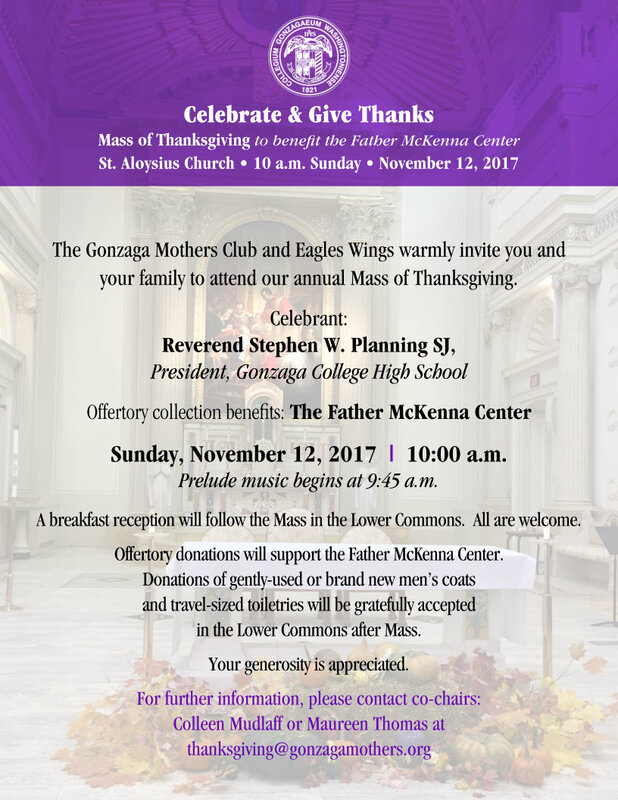 Hopefully everyone has received the beautiful invitation to join the GMC and Eagles Wings at this annual mass. Many thanks to all the families and friends of Gonzaga who have already given so generously to the annual gala, Winter Wonderland, by donating their time, talents, and treasures. The excitement is building for the biggest party and fundraiser of the year on December 2nd. Kim Howland and Maggie Sinnott Mejia, along with their teams of volunteers, have been working hard since the summer to create a spectacular night of celebration and festivities. We have wonderful auction items (including Springsteen on Broadway tickets!) incredible food and even better company to be enjoyed. RSVP soon, since the Gala sells out each year. Find out how to volunteer and join in the fun at Gonzaga Gala. The Gala Basket Making Party will be November 18, from 10 a.m. t0 12 p.m. and the fun days of Decorating and Set Up will be on November 30th at 3 p.m. and December 1st starting at 9 a.m.! Come join the fun! Many thanks to Mary Goodyear and Barbara Mulligan, for providing hospitality for the Senior Family College Night for College Counseling. Our first quarter Parent Teacher Conferences were held last month, as well -- thank you Stacey Brown and Jill Gatti for the delicious refreshments. Also, thank you to April Egge, Kristina Gill and Laura Tramonte for providing a wonderful dinner to the faculty before the conferences. Thanks go out to Joan Baughan, Anne Ghattas and Honora Precourt for continuing to coordinate the food and details for our GMC meetings. All of these events extend our already busy days and the effort all these moms put into nourishing us is greatly appreciated. Our next GMC meeting is this Wednesday, November 8 at 6:30 pm. Father Planning will provide the blessing and an update on Eye Street and our speaker will be Dr. Gregory Merrickfrom Wheeling Hospital. Dr. Merrick will be speaking to the students during school, the sports teams after school and the GMC at our meeting about Men's Health. Also, please remember to bring unused Christmas cards that can be used for our Christmas Cards and Treats service project on December 6 (the students receive a "treat" and write a Christmas card to local shut-ins and nursing home residents). Nominations will be open in January for GMC positions for the 2018-2019 school year. Do you have computer talents, a gift for decorating, or a flair for hospitality? There are so many jobs and such a variety of talents needed. I encourage you all to consider nominating yourself for a position. It is a great group of ladies! You can have fun working and make some great friends in the process. 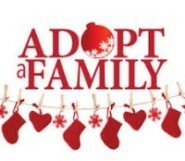 November 10th is the deadline to sign up for annual Adopt-a-Family program. Each year, Gonzaga families coordinate with Campus Ministries to provide Christmas gifts for 35 or more needy families via the Adopt-a-Family program. It is a wonderful way to bring Christmas cheer to our Gonzaga neighbors. Can't adopt a whole family? No problem, you can sign up for as many, or as few, people are you are able. Get together a group of your family members, friends, teammates, or club families to support others in our community. 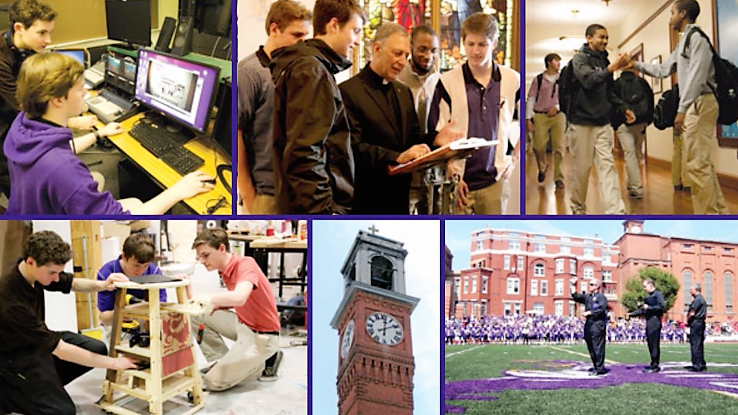 Gonzaga’s Open House will be held on Sunday, November 19, 2017. Can you volunteer for a couple of hours to welcome prospective new families to Gonzaga? If you can help please sign up here...This is a great day on Eye Street! The GMC provides hospitality for many of the upcoming events; so if you would like to assist, please contact the Committee Chairs. All Committee Chairs are listed in the back of the Gonzaga telephone directory and on the GMC website. Thank you to Hazel Lychak, Communications Chair, for her organization and talents in putting together this and all of our GMC Communications! We look forward to seeing you on Eye Street! Buy your Gala tickets now! prepare and transform Eye Street into a Winter Wonderland! Christmas is coming! Would you consider helping to provide a happy Christmas for a family in need through our annual Adopt-A-Family program? Each year, Gonzaga families coordinate with Gonzaga Campus Ministry to provide Christmas gifts for 35 or more needy families via the Adopt-A-Family program. We are still in need of donors and the deadline to register is Friday, November 10th! Can't adopt a whole family in need? No problem, you can sign up for as many, or as few, people as you would like. You can also get creative and adopt a family as a group, by coordinating with teams, clubs, friends, co-workers, extended family, etc.! Questions? View the flyer. You may also contact Nancy Travis at secretary@gonzagamothers.org or David Bowles in Campus Ministry at dbowles@gonzaga.org. Thank you! Your generosity will help make Christmas special for Gonzaga’s neighbors. Mark your calendars to attend this wonderful event! Also please sign up to provide food items, set up or clean up for the Mass of Thanksgiving on Sunday, November 12th. 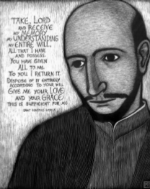 Mass begins at 10 a.m.
Why not get a club or team to cook, serve and eat dinner with 20 grateful men? Please sign up for BOTH slots if you intend to cook and serve the whole meal. We need your help now to fill the open dates! All instructions are included on the Signup Genius. We still need help for some November and December dates! Can you volunteer for a couple of hours to welcome prospective new families to Gonzaga? If you can help please sign up here...This is a great day on Eye Street! Calling all volunteers who want to assemble and wrap baskets for the Gala. No experience needed! Just a few hours of your time. We'll provide the baskets, wrap, bows and fun! The 2017 Gonzaga Gala, Winter Wonderland, is quickly approaching! The Gala Committee has been working tirelessly to present another beautiful evening on Eye Street. We are now looking for volunteers to deck the halls and support the success of the event throughout the night. In particular, we need volunteers for SET-UP & DECORATING CREWbeginning on Thursday, November 30 at 3:00 pm, and on Friday, December 1 at 9:00 a.m.
We also need many volunteers the night of the gala. Are you interested in being an EVENT VOLUNTEER on Saturday, December 2? If so, please plan to work the entire evening. You will receive a complimentary Gala ticket, which will include dinner and the ability to bid on auction items. If you have any questions, please contact us: 2017@gonzagagala.org or Katie Ronca, volunteer coordinator, katieronca@verizon.net.